If you know a volunteer who’s doing great administration duties in your sport or recreation club/association and deserves recognition, we want to hear from you. The Department of Local Government, Sport and Cultural Industries (DLGSC) is searching for sport and recreation volunteers in the Great Southern who make their club a better place because of their support and service. If you know someone like that, please nominate them for the Annual Mike Stidwell Medal by following this online nomination link. Nominations are open during April for this annual award which recognises outstanding contributions to sports administration. 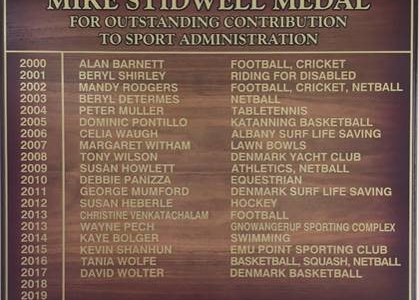 The award honours the memory of former Department of Sport and Recreation Regional Manager Mike Stidwell and his selfless and long-term contribution to sport and recreation in the region. This award recognises that volunteers are the backbone of their clubs and communities and if you know someone like that in your club, I encourage you to nominate them so that their hard work and generosity can be publicly acknowledged during National Volunteer Week (20-26 May 2019). The selection committee will consider a combination of administrative performance, length and type of service, value to the organisation, people skills and character. • You must live in Great Southern region or have done so within the past two years. • Nominees must predominantly have been involved in a sport and recreation club or group in a volunteer administrative role. • Previous nominees may be re-nominated this year. This acknowledges the fact that valued contributions are often made over many years. The late Mike Stidwell was Regional Manager of the former Great Southern Department of Sport and Recreation from 1979 – 2000. The first medal was awarded in 2000 and is an on-going award through his family. The winner will be announced at a Volunteer Recognition Sundowner at Centennial Stadium on Monday 20th May 2019.